Today is Duan Wu Festival 端午節 or Dragon Boat Festival. The origin and story behind this festival see Wiki. 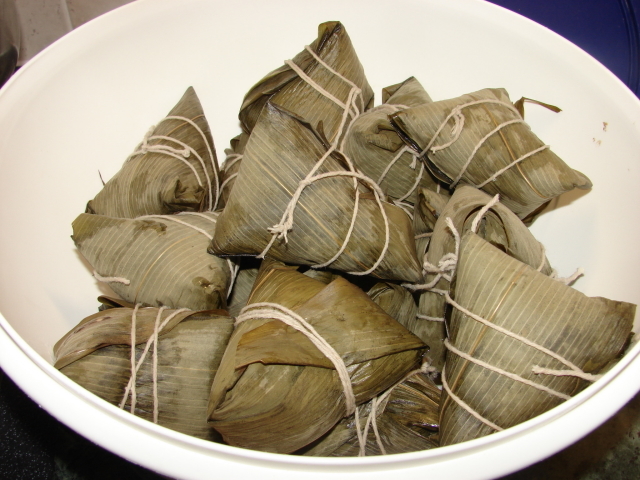 Zhongzi or leaf wrapped dumplings are a must to be eaten during this festival. There are few ways to wrap zhongzi. Most people use bamboo leaves, available dried in most countries and fresh is available in some S E Asian countries. Other leaves may be used. 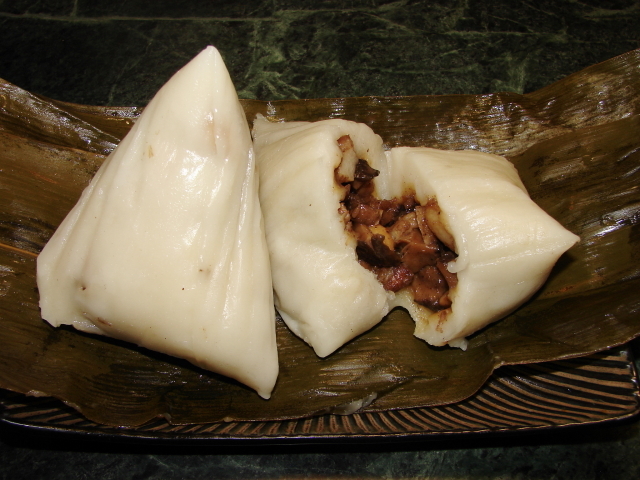 Nyonya style zhongzi sometime added pandan leaves mainly to add flavour. Shapes of zhongzi, the most common are triangular shape and a longish pillow shape. I always wrap mine in triangular shape. 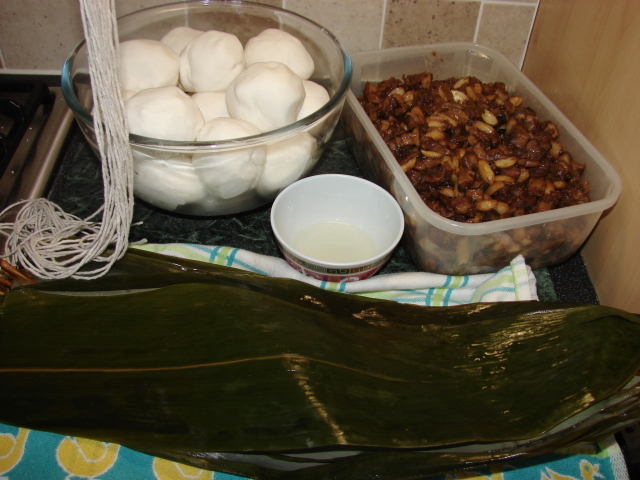 These are different zhongzi recipes posted previously. More detailed pictures available for wrapping. Today recipe is a different type of zhongzi made with a rice flour dough than the usual with glutinous rice grains. 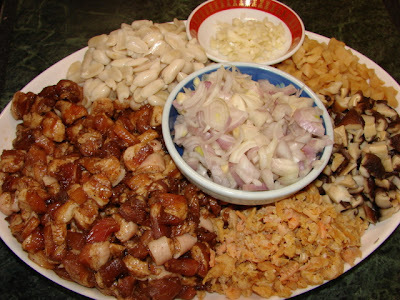 This is a Hakka delicacy called bun zong 粄粽 or guo zong 粿粽. The resulting dumplings pastry is similar in texture to mochi. Soft and chewy. *For a more chewy pastry texture can reduce amount of rice flour and increase glutinous rice flour to 2 : 3 or even 1 : 3. Test it yourself how chewy you like the pastry. More rice flour will reduce the chewiness. For this recipe I was using 1 : 1. Mix glutinous rice flour. Pour and measure boiling water into a jug, stir in salt to dissolve. Slowly stir the flour and pour in boiling water. The dough should look lumpy. Cover and leave to cool. When cool enough handle, scrape all the dough lumps and dry flour onto a working board. Add oil and start kneading. Slowly add in the cold water a little at a time till a soft and fairly sticky dough is formed. Scrape the dough off hands and scrape the working area clean. Transfer dough into a bowl. Wipe clean the working board. Brush working area/board with some plain cooking oil. Gently knead till the dough is smooth. Divide the dough into 18 - 19 pieces, each around 85 - 95g. Roll each lump into a ball. Cover with clean tea towel. Boil/simmer peanuts for about 30 minutes. Drain and leave to cool. Retain boiling water to cook the meat mixture later. Peel and slice shallots. Fry with 1/2 cup of oil till golden brown. Pour the lot through a sieve and collect oil in a bowl. Drain well. Soak mushroom till softened and cut into small pieces. Can retain soaking water to cook meat mixture. Cut mushroom into small pieces. Slice/roughly chop the preserved raddish. Rinse and squeeze dry to remove some of the saltiness. Soak dried shrimps for about 5 minutes. Drain and roughly chopped. Cut pork into tiny chunks. Marinate with 2 tbsp light soy, 1 tbsp dark soy and 1 tbsp five spice powder. Leave aside for about 30 minutes or 1 hour. When everything is prepared. Now cook the filling. Fry garlic with a little oil. Then add all the solid ingredients except meat and fried shallot. Stir fry for few minutes till heated through and fragrant. Stir in fried shallot. Season with some dark soy and a bit more five spice powder. Remove and set aside. Heat a little oil, stir fry the meat. Stir till the meat is drying up and meat is lightly caramelised. Add dash of dark soy, dash of cooking wine and 1 cup of water/liquid (peanut cooking water/ mushroom soaking water/ plain water). Simmer for about 30 minutes. Add the remaining precooked ingredients, stir till heated through and sauce is absorbed. Add slackened cornflour, stir till thickened. Remove, cover and leave to cool. Soak about 45 dried bamboo leaves with tap hot water till softened. Then boil in a large pot or wok for about 15 - 20 minutes till pliable. 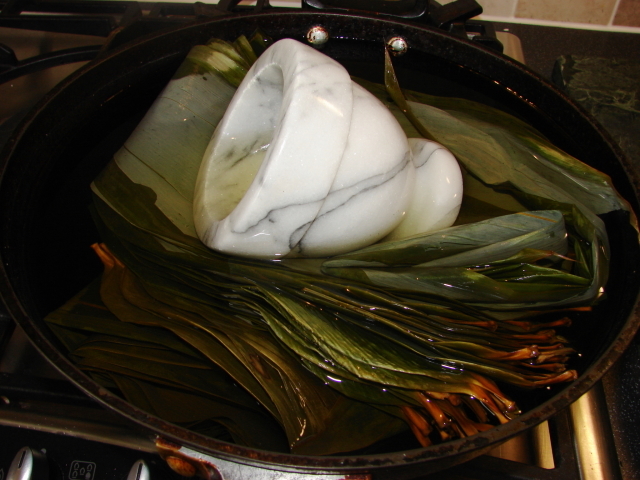 Fold the leaves into half during boiling, weigh down with something heavy. Leave in the water till ready to use. Tie a bundle a strings (each about 50 - 60cm long). Tie this bundle onto a door knob or kitchen cupboard handle. Dough, string bundles, filling, oil and soaked leaves. Take a lump of dough, flatten on the oiled surface to a round disc about 5mm thick. Lift up the disc onto one palm, gently pinch the edge thinner than the centre. The final size of the disc is about the size of palm, about 10cm wide. Add a pile of filling onto the dough, about 2 - 3 heap tbsp. Wrap dumpling like a baozi. Pleat and gather the pastry edge to form a ball. Smooth rough edges with finger. Brush the surface of the dumpling lightly with oil. If the dumpling break and too thin on any one spot, seal with a small piece of dough, smoothen with finger. Continue wrapping all the dumplings. Cover to prevent from drying. Take a pastry wrapped dumpling, gently form it into a bell shape with one end pointy. Take two pieces of leaves, cut off the hard stem at one end. Rub and dry leaves with clean tea towel. Stack the two leaves together. Twist at one end to form a cup. Put the dumpling into the cup, with pointed end facing down. Gently press the dumpling to mould into the cup. Flatten the top suface. Fold the leaves (see slide show) to wrap dumpling into a triagular dumpling. Tie with string, not too tied. The dumplings will expand during steaming. When all the dumpling are wrapped with leaves, they are ready for cooking. Steam the dumpling for about 50 min - 1 hour. When done. Remove and cover. Leave to cool. Put remaining in fridge or pack into freezer. To reheat. steam till heated through. If frozen defrost before steaming. Now I can see why I had such problems with my Japanese chimaki, these are wrapped in bamboo leaves too. I didn't know how to prepare the leaves and soaked these only in water for 20 minutes. Do you maybe know fu-mochi? It is a Japanese sweet(wagashi) made with glutinous rice flour and wheat gluten, is there maybe something similar in other cuisines? If you are Japanese you probably know chimaki more than I do. Chimaki is the Japanese zhongzi (I guess originate from Chinese). There are glutinous rice grain chimaki and mochi type chimaki like this recipe I posted. Mochi type chimaki usually made with a dough of mochiko (Japanese equivalent of glutinous rice flour) and joshinko (Japanese equivalent of plain rice flour). Never heard of fu-mochi. Could this be daifuku? Traditional daifuku is made with cooked glutinous rice pounded to a sticky chewy paste before wrapping into cake. Easy daifuku the dough is made with michiko flour and water. I don't think any mochi is made with wheat gluten. I think this could be wheat starch or cornstarch which is used to coat the mochi surface so it is not sticky.